For all the gains won by the civil rights movement in the 1960s and legal protections against racial discrimination in the years since, the march toward racial equality in the United States can seem a case of one step up, two steps back. 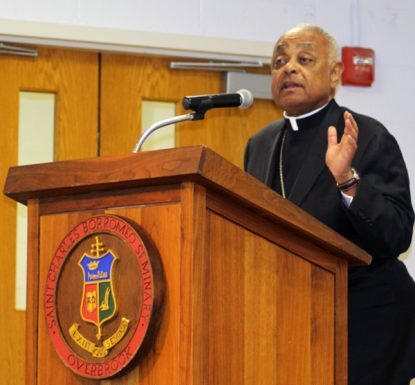 An examination of the economic impact of racism, provided by Archbishop Wilton D. Gregory in a talk Dec. 6 at St. Charles Borromeo Seminary, showed the family finances of black and Latino households continue to fall behind white households. The archbishop did not address the letter specifically, but instead he presented evidence that African Americans suffer from racial discrimination in home ownership, lending practices and employment. He made the case that the evils of economic injustice and racism go hand in hand — and with devastating consequences. While it is generally understood that African Americans on average have less wealth than whites, that inequality also means less opportunity for upward social mobility and fewer chances to pass accumulated wealth to the next generation, according to the archbishop, who cited data from the Federal Reserve System’s Survey of Consumer Finances for 2016. “Redlining,” or housing segregation due to denial of mortgages based on race, was prohibited by law in 1977. But discrimination persists in the mortgage market; blacks still are less likely to be homeowners than whites, and therefore have less access to tax benefits and savings that come from home ownership. With less money in savings, families of any background will turn to credit to meet their needs if they fall behind on bills or experience a financial emergency. Home ownership offers credit at the lowest rates. But African Americans often hold more high-interest debt such as installment payments for consumer goods, student and car loans, plus predatory “pay day” loans. And black households generally carry larger credit card balances than whites, according to the data cited. In addition to lower income and higher debt among the median African American family, Archbishop Gregory cited some two dozen academic studies from Northwestern and Harvard universities since 1989 that showed the persistence of hiring discrimination against black job applicants. Besides managers screening for stereotypical black and Latino names on resumes, in-person interviews among 54,000 identically qualified applicants for 25,000 job openings resulted in “white applicants receiving on average 30 percent more call backs than equally qualified African Americans,” the archbishop said. He dismissed as simplistic the Trump administration’s reliance on job creation as a “cure for America’s racial inequality” because “racism is a deeper problem than just economics,” the archbishop said. “Jobs alone will not stamp out racism. There has been, and is, profit in racism. As a nation, we cannot address racism if we are still denying that it exists, that it doesn’t have real economic impact on people of color,” Archbishop Gregory said. The comparative state of family finances was made clear in the Federal Reserve report, which showed that the median wealth of blacks was 14 percent of whites in 2007 at the start of the Great Recession. Although the economy had recovered by 2016, many families had been left behind, with the median wealth of blacks falling to less than one-tenth that of whites. And that trend is intensifying with changes to the tax code enacted at the end of 2017, as “families with higher incomes receive increased tax incentives,” the archbishop added. Assessing the gap in wealth between white households and those of blacks and Latinos, the archbishop cited the Institute for Policy Studies’ report, “The Road to Zero Wealth,” which showed the wealth of the median black household declined 75 percent from 1983 to 2013, while median Latino household wealth declined 50 percent. Meanwhile in the same time frame, median white household income increased 14 percent. By 2020, median white households are projected to own 86 and 68 times more wealth than black and Latino households, respectively, according to the report. “This isn’t a wealth gap, it’s a wealth chasm,” Archbishop Gregory said. He cited perhaps the most grievous example of economic and racial injustice today: unequal pay for working women. While white women typically earn 80 cents for every dollar paid a man for the same work, black women — 80 percent of whom are the key breadwinners in their families — earn only 63 cents for every dollar paid a white man. “Closing the wage gap for black women means less families living in poverty, community stability and more spending money to stimulate the economy,” Archbishop Gregory said. One of them is the Paycheck Fairness Act currently in Congress, which the archbishop said enjoys bipartisan support from two-thirds of all voters in surveys. It has languished in Congress for 21 years. Responses to “persistent discrimination in housing, hiring and lending” cannot be made by policy makers, the archbishop said, “without addressing the chasm that continues to grow between the wealthiest people in American society” and those on the economic margins, especially blacks and Latinos. At the foundation of the racist attitudes that create the economic disparities is hatred, he said. While the church refuses to effectively address and END the abuse scandal that has plaqued it for decades, church leadership finds it necessary to preach politics. Get your own house in order before you preach to others about fixing the world! Bishop Gregory needs to focus on other issues, for instance a Universal Catholic Church in which African and Asian Catholics often live in poverty which Americans can’t even fathom. My heart is with the poor of Burkina Faso, the Philippines or Burma not the US who live in relative wealth. I was shocked to read that median black household wealth dropped 75% from 1983 to 2013. This would have been in an interval when the most blatant racism in hiring and employment would have been declining. Does this statistic address the number of single parent households, and has that changed? I know that whites have increased in single-parent households but that has not been true for college-educated whites who marry at the same rate as previous generations. (it has been true for non-college whites, and their wealth has also dropped). Stop crying racism for your own inefficiency.. I understand that there is racism in the world. However, in my experiences as a senior citizen , I have seen more minority hiring privilege, than discrimination against minorities. Get an education or trade, get a job, get married, have kids. No mystery. Another Bishop preaching politics of liberalism. A real lack of research was done writing this article. Where is the evidence that Blacks are discriminated against when applying for mortgages? Just because Black home ownership is lower than whites does not mean that this due to racism. This is baseless! The author should understand that race baiting is very dangerous and leads to more hate.